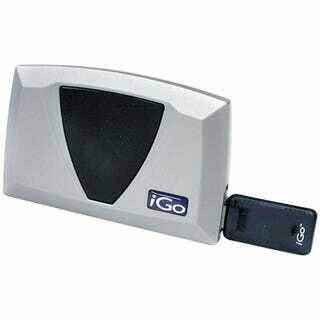 Stay calm, the iGo Pitch Duo has nothing to do with some hackneyed iPod accessory. Rather, it's a Bluetooth-based projector system for PDAs and smartphones, like the Treo 700p. Useful for businessmen and other people who need to have their big presentation on their always-with-them PDA, the Pitch Duo connects directly to projectors and acts as a Bluetooth access point of sorts, passing along the presentation-laden signal onto the projector. This frees you from having to bring your laptop with you everywhere you go. Since most businessmen probably need their laptop with them (how else can they access Internet Explorer, i.e., the Internet?) at all times, how many of them will choose to be freed is unknown. The Pitch Duo also allows for text input thanks to tow PS/2 ports. It's powered by a "Pentium-class" processor, so you shouldn't run into any problems with slow slide transitions, embarrassing you and your boss.